Blasts from vuvuzelas rang out as word spread that Congolese President Joseph Kabila had been declared winner of the country’s second-ever election since independence. After more than a week of waiting since Congolese went to the polls on November 28, the mood in the eastern cities of Goma and Bukavu was marked by an eagerness for the process to be concluded. “The limbo of not knowing what the results will bring is fatiguing for people,” said Enough researcher Sarah Zingg Wimmer in Goma. With rain coming down, muddying Goma’s usually dusty streets, and dusk approaching when the national electoral commission released its final count many of those out in the street were celebrating Kabila’s re-election. Kabila finished with 48.9 percent of votes while his closest opponent, Etienne Tshisekedi, garnered 32.33 percent. “Our school fees will be paid and the opposition should keep quiet,” shouted an 18-year-old boy in Bukavu as he ran off to celebrate. Others Enough spoke to in the streets of Bukavu were more cynical. “I give only six months to all of these people who are shouting and cheering because Kabila is proclaimed winner. They will get totally disappointed,” said a middle-aged man and father of four. Tensions mounted during the two- then three-day delay when the country waited for the final election count, as the national electoral commission called for more time to tally the votes. As reported on Wednesday—the day when results were originally expected—even people Enough spoke to who said they voted for a different candidate expressed resignation about the anticipated Kabila victory. 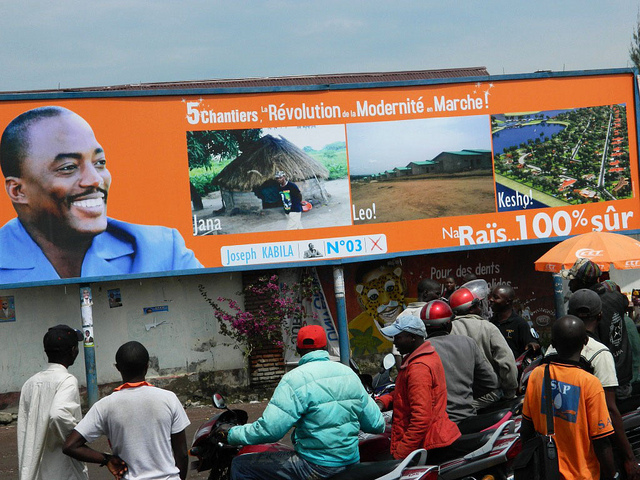 In some cases, people said they were relieved their candidates were not winning, considering the likely backlash in the East from armed Kabila supporters. Armed groups in the East, including soldiers, were reportedly involved in efforts to encourage or intimidate voters into supporting Kabila. But as other commentators have been quick to point out, today’s announcement by the electoral commission is hardly the end of the process. The Kabila government’s massive deployment of police and soldiers, paired with vows by opposition parties to contest the results may prove combustible in tomorrow’s daylight. Reacting to the official count, leading opposition candidate Tshisekedi went so far as to declare himself president, again, according to media reports. "I consider this [result] declaration an outright provocation to our people and I reject it in full,” Tshisekedi reportedly stated. "I call on the international community, which has relentlessly encouraged me to guarantee a peaceful process, to not only find a solution to this problem but take all possible measures so that the blood of the Congolese people is not spilled again." Following news of the announcement, the Enough Project issued a statement urging all parties to utilize the “appropriate channels” to air grievances. "The many troubling reports of electoral manipulation, intimidation, and violence need to be fully investigated," said Enough Project Executive Director John C. Bradshaw. "But these irregularities should not be used to justify violence by any parties, who should instead rely on peaceful processes to resolve any disputes." Amani Matabaro contributed to this post from Bukavu.